Ever since I met Cliff Mcnish last summer, I have been desperate to get him to come onto the blog, so I was really pleased when he agreed to this interview. Cliff's book The Hunting Ground has just been republished as a paperback under Orion's new imprint Indigo. I will be reviewing this book on the blog later today. What inspired you to write The Hunting Ground? I’ve always liked creepy ghost stories. In BREATHE I’d created an obsessive mother. This time I wanted to create a truly monstrous adult, but I was equally interested in the little ghost girl locked away with him. Every ghost story should have a little girl in it somewhere, don’t you think? The cover of the book sends a shiver down my spine. Did you have any input or say in the design of it? I got final approval and I also suggested the lighting up of the sky. Otherwise it was all the brainchild of the excellent Orion team at the heart of all production decisions, led by Amber Caraveo. Glebe House sounds really creepy. Is it based on a real house or has is just been conjured from your dark imagination? I guess it’s a composite of many old houses. But the dark heart of it – The East Wing – is entirely a creation. Do you like to read books that scare you witless? I like to read books that keep my attention, and that often, for me, means a certain psychological tension, rather than blood and gore. I particularly love it when an author scares me by unexpectedly tipping characters and plot into odd places that still feel psychologically true. Supernatural stories especially should feel off-kilter, and many authors don’t know how to achieve that. After meeting you at the Orion Summer Party, I am aware of your wicked sense of humour and I wondered if you would ever write a satirical book? With each book that you write, do you find it gets easier or harder? Harder, usually. Partly because you don’t want to repeat yourself. Partly, also, because as you gain in technical skill more options open up to you about execution, which paradoxically makes some choices harder rather than easier because you can envisage so many more viewpoints/styles to adopt. Plus, as you get more experienced, you should get more ambitious – which automatically means you have to work harder, and that’s just as it should be. Do you meticulously plan out your books or do you just go with the flow? I plan the outline, making sure that the overall story arc works and that I have the characters to drive it. I also do a basic plan for each chapter. Then I just write and see what works. Half the original plans gets jettisoned in the process but only because you improve on it. How long does it take for you to write the first draft? Do you read many books by debut authors? If so, which book did you enjoy the most? I wouldn’t say I focus on debut authors, but sometimes new writers can astonish you. Amanda Coe recently debuted with WHAT THEY DO IN THE DARK and it was so scary and brilliant. Adults only. 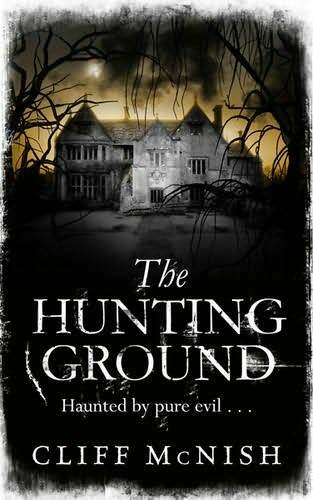 Will you be doing any book signings to promote the paperback publication of The Hunting Ground? Apart from your own books, which book do you wish you had written? Good Question. The best YA book I’ve ever read (in terms of grip, originality, and sheer writing brilliance) is Melvin Burgess’s BLOODTIDE. Study the YA and children’s market closely. Read in it widely and feel the power and breadth of the competition. Don’t be daunted by it, but learn about it. Far too many would-be children’s writers hardly read any kids fiction, but somehow still expect to be successful in it. It works the other way round. I read that you are a lover of hot and spicy food, what is the hottest thing you have ever eaten? A mature naga chilli. Mind-blowing. Most people would die if they ate it. I took it down in slivers with a nice Chianti. Thanks Cliff for joining us today. I love the Hannibal Lecter reference at the end. Eeep! The Hunting Ground is available to buy from all major bookstores. Pop back at 3pm for my review.